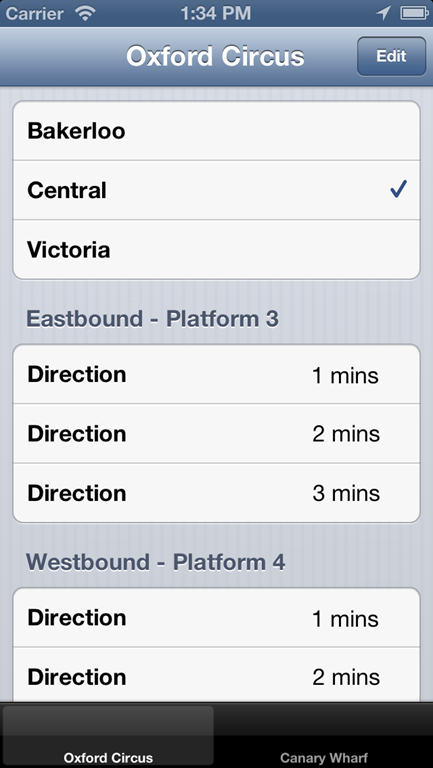 In my never ending quest to release tube related apps, I’ve pondering a new idea. Current tube apps are getting very busy, showing maps, line states, departure information, journey planners, weekend works, station states, etc. I don’t deny that these apps are very feature packed and for an average price of £0.69, you can’t really go wrong. But something bothers me about this – I feel like there has been a rush to pack in features in order to appear competitive. With this feature packing, the usability of an app always suffers because there is much more noise. With this in mind, I’ve started building a very simple app that just puts a few key pieces of information at the user’s fingertips. I reckon most commuters just use two stations in their course of their daily journey. They only care about one or two lines too. All the rest is just noise. The app just has two tabs (I might add two mores) and that will just present the basic information for that station to you. This way you get presented with the information you’re most interested in. I’ll probably add location services to give alerts of issues as you get close to the station. I hope to have this submitted to the App Store within the next couple of days. I’ve got most of the back end infrastructure in place for the London Underground. I’ve been reading up on GTFS too, so I may be able to include the New York Subway in the future. If you like or dislike, please leave me a message in the comments below! ← GetPathRoot() –a cautionary tale….